preservation of normal hepatic functions. thus providing a more useful metabolic process. -Also, it increases immunity against viral hepatitis. 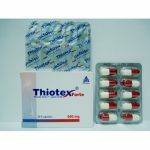 1-Protection of the liver against injurious effect of viral infections.